Here are some take-away from James B. Glattfelder’s talk on Who Controls the World. 1. Complexity is the result of simple interactions. The system as a whole is starting to behave in ways which cannot be understood or predicted by looking at the component of the system. Examples of emergence include termite and mold. The concept of emergence relates to the property that the whole is more than the sum of its parts. 2. Every complex system is understood as a network of interactions. James quoted the example of The Network of Global Network Control. 3. Who are the key players? Who controls the world? 4. Are ideas and concepts more important than empirical data? 5. With 36% TNCs, but 95% value, does it follow Power Law? Controls accumulate at the nodes. 6. It seems self-organization are operating in these networks, rather than top-down approach in the control of these networks. How would such learning be applied to education? The present trend of the rapid expansions of MOOCs (see also this Class Central list) and open online education courses (such as Open Universities) do exhibit most of the properties of Complex System and Complex Adaptive System, especially when education is now open to public, and to the world. I have shared the ideas and concepts on Knowledge Ecology and how the different agents have interacted and co-evolved under a changing education system. The current MOOCs are demonstrating various behaviors which cannot be understood or predicted by looking at the component of the system. At the start of the MOOCs movement, all elite institutions refused to accept MOOCs for credits to their degree programs, and thus deny the recognition of any completion of MOOCs as equivalent to the academic studies in their institutions. Now Georgia Tech is partnering with Udacity to offer online Master Degree Program. Would this change the dynamic of degree offering for Higher Education Institutions? 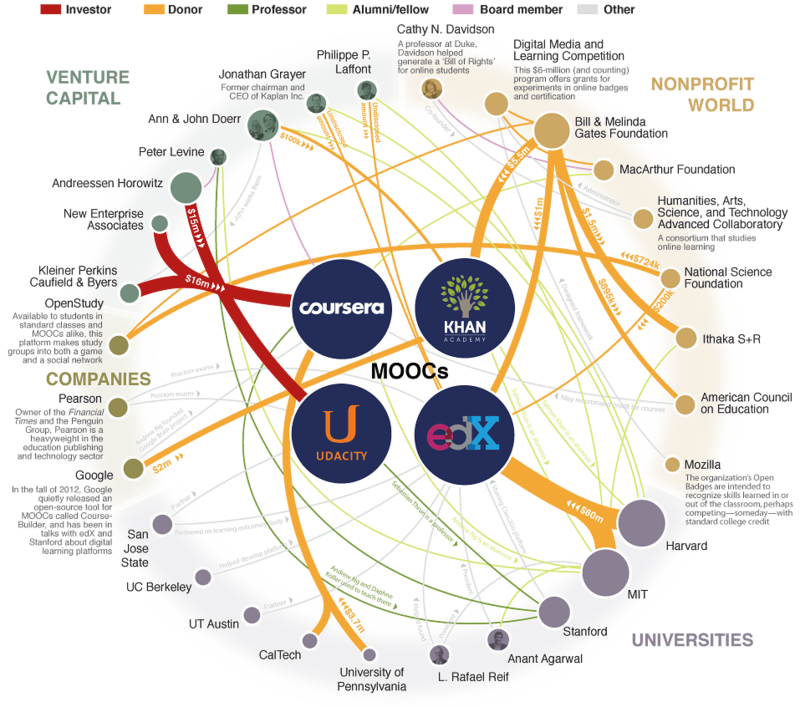 It seems the three major players in xMOOCs – Coursera, Udacity and edX are now constituting approximately 90+% of the MOOCs provision and the associated investments (approximation based on the Ivy League table, though this needs to be updated). There are however new MOOCs players such as Future Learn in UK, Open to Study in Australia, First MOOC for Denmark, coming on board in 2013-2014 and this would soon change the network dynamics of MOOCs. Would the ideology of MOOCs be democratizing education? Would the ideology of MOOCs be monetization, commoditization and privatization of Higher Education? How would those ideologies impact on global Higher Education? What could we learn from Complexity Science, when applied in Education? I will be creating a few posts on Complexity Education soon. 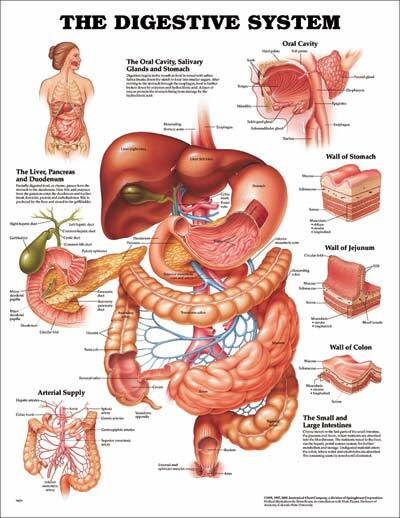 Here are some relevant sources of information. Would computers be replacing teachers soon? Do you think online education would replace part or most of the face-to-face education? Cash-strapped school districts, from Florida to Washington, have discovered that minimally supervised students hunched over laptops can outperform their lectured counterparts for a fraction of the cost. As long as schools measure performance simply by rote memorization on multiple-choice tests, no teacher can compete with instant access to the world’s information. Unless schools change, more and more teachers will find themselves replaced by computers. Tony Bates remarks in his post and I responded here. Educating the world, with more automation seems to be the trend that wouldn’t be turned back. Productivity is the key to mass education, and the wheel would move on. So, we might be better off in checking the pulse of such changes, and adapt to them, in response. Education is a great business for every one to get into, in order to lead us to a great future. Emergence of MOOCs – Part 3 MOOCs as SURPRISES! What does a MOOC look like now? MOOC has now evolved into a Mega Network of Massive Open Online Courses with a conglomerate of many open online courses all forming Hubs around the BIG THREE – Coursera, Udacity and edX. What are common among the big three? Common words are: Free for Coursera and Udacity, and Education for Udacity and edX. 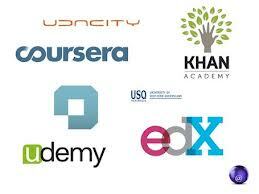 Taken together, they all are offering education, online courses for free. Their pedagogy are all based on instructivism (a cognitive and behavioral approach towards teaching and learning, with mastery learning). 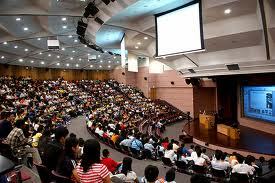 The MOOCs are based on the best media platforms available and offered to any one in the world. There, you would be able to get the courses run by the best and “super” (rockstar) professors, who will be at the centre stage of teaching, delivering world class education. What is the medium of MOOC? What are the challenges of MOOCs? Here what you need to know about MOOC provides a useful summary, and there are many more, as collected in my post. Is MOOC a surprise to you? 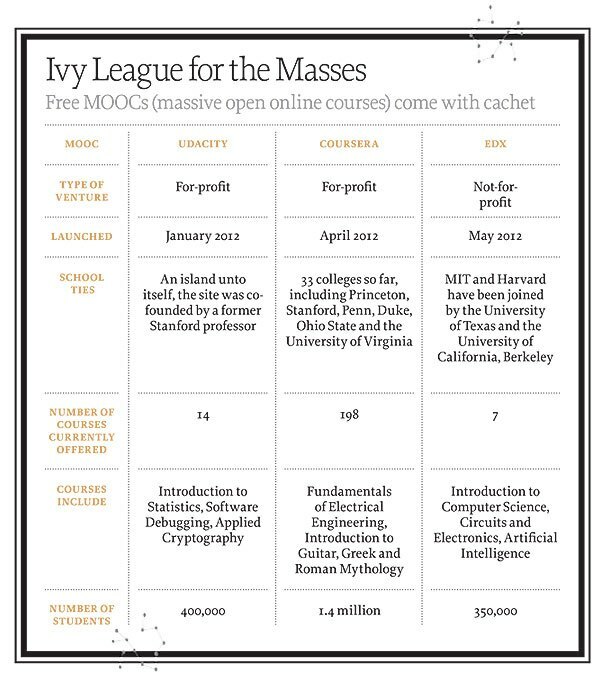 The year of MOOC has caught many by surprise. Even the x MOOCs co-founders were caught by surprise. “This has caught all of us by surprise,” says David Stavens, who formed a company called Udacity with Sebastian Thrun and Mike Sokolosky after more than 150,000 signed up for Dr. Thrun’s “Introduction to Artificial Intelligence” last fall, starting the revolution that has higher education gasping. If you were to ask me: Did MOOCs catch you by surprise? My answer is: No. I have longed thought that MOOC would become a reality before 2008. Since joining CCK08 in 2008, I was more than convinced that MOOC would one day be ubiquitous, like the networks and communities formed and re-formed around us, in the edge and core of the webs, spreading throughout the internet. I had on a few occasions worked on that – the Connectivism Ning, the Facebook, the wikis, etc. that were all networks of “practice” where practitioners would all be too happy to come and go, sharing and collaborating with each others with an open NETWORK, similar in nature to THE MOOCs. What MOOCs need might be the branding, the timing and opportunity that the prestigious institutions have, and of course the funding required to run the MOOCs, so professors could work on, and learn from. I had discussed these trends of MOOC back in 2010 here on the future of education. Dave Cormier, George Siemens had organized MOOCs where discourse on future of education – a course in future thinking was held in 2010. Stephen Downes had been an active promoter of open education and personalized learning with PLE/PLN for the past decade. These had all been discussed in the last sessions of various CCKs – 08, 09, CCK11, Change11. Here is a summary of CCK08 by Stephen Downes. 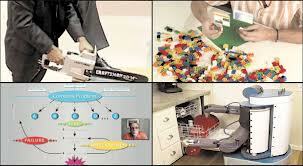 See Stephen Downes’ OLDaily for more posts on future of education. Is disruptive innovation of MOOCs good enough to revolutionize Higher Education? In my post relating to disruptive technology: Clayton’s prediction of disruptive innovation could rightly provide us with the crystal ball: that innovative disruption would likely be repeated for any businesses – including education, and HE in particular, especially in highly developed countries, or a global market. These seem to have been demonstrated in the current MOOCs phenomena too. Are we ready for these sorts of “disruptions” in education? Time will tell. Are we at the cross-road of Higher Education? MOOC is now the CENTRAL ECONOMICS OF EDUCATION – DISRUPTING the Higher Education to its fullest extent. Here efficiency and effectiveness of education has finally been drawn based on this CALL CARD – MOOC to revolutionize Higher Education. You got to love free Higher Education! But there is a price to pay. MOOC and you’re out of a job: Uni business model in danger. Are you a super professor? Have you delivered a xMOOC? What were your experiences in the teaching and learning with x MOOCs?